Authorities are investigating who mistakenly declared a man dead while he lay bleeding internally for hours in an apparent suicide attempt after he allegedly killed his wife in their Long Island home last month, police said. When paramedics were called to the Middle Island home on Feb. 28, they never entered -- they were told by the Suffolk Police Department that it was a crime scene and that the assumption was that the couple inside was already dead, according to the Middle Island Fire Department. So they were shocked nearly three hours later when they entered and found Erdem Gulay still breathing inside the house. The 41-year-old man had killed his wife before stabbing himself in the chest, police said. But he survived for hours, and had been left bleeding inside. 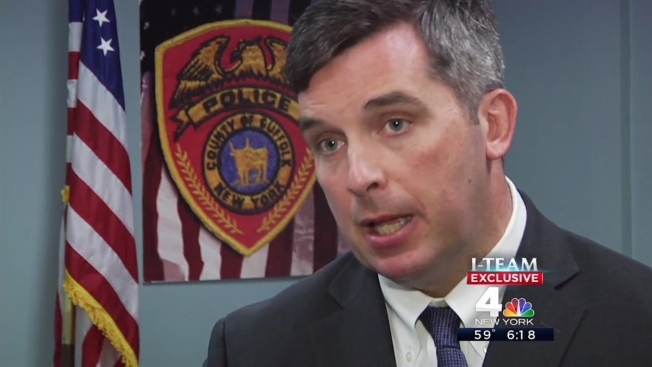 “He did have massive injuries,” said Suffolk County Det Lt. Kevin Beyrer. “There was blood all over the floor and empty pill bottles, as well as an overwhelming smell of gas." The woman who was found dead in her home with her injured husband was the victim of a homicide, police said. Greg Cergol reports. He added, "the overall scene would lead a reasonable person to think that person was dead." Police said they were called and asked to check on Gulay and his wife Fahriye Ugan, 54, at about 8:45 p.m. Feb. 28. When they arrived, they say they were overwhelmed by the smell of gas and they called the fire department to help them ventilate the home. Finally, when they did enter the home, police say they found Ugan upstairs, bludgeoned to death. It wasn't until forensics detectives investigated that they discovered Gulay was still breathing. Gulay survived until the following day, when he succumbed to his injuries. It’s not clear what time emergency workers first entered the residence. An ambulance arrived at 9:28 p.m., but was sent away by 10 p.m. Hours later, the ambulance was called again. Beyrer said police are investigating who mistakenly declared Gulay dead and why. “Was it officers? Firefighters? We are still working on the details of that," said Beyrer. Officials from the Middle Island Fire Department say they have been asked to provide information to assist the police investigation into the matter. Diahanna Hovanek used to frequent a bagel store owned by Ugan and Gulay, said the couple were "nice people. They ran a nice little place." Joseph Giacalone, a professor at John Jay College of Criminal Justice in Manhattan said only an EMT or a doctor can determine whether a person is dead.